This was another book that I really wanted to like, but just didn't. 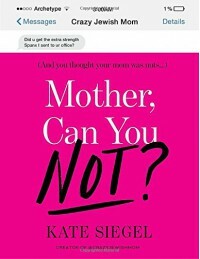 The book spiraled out of the Instagram account Crazy Jewish Mom, which posts screenshots of real text conversations between a 20-something and her #CrazyJewishMom. Turned into short stories, the concept didn't really land. The mom seems hilarious, but there are moments (the hyper-fixation on thinness) that are too much. The author tries to couch this by arguing that her mom wouldn't have to say such things if we didn't live in such a sexist world. That's a lukewarm argument if I ever heard one. And the writing simply isn't very good, unfortunately.